An easy way to remove DRM from old iTunes songs and get your iTunes songs ready for use on any computer or mobile music devices. Presently, all iTunes purchases are DRM-free and music purchases are provided in 256kbps AAC. However, if you had made any older purchases (2009 and previously), you’d still have files protected by FairPlay DRM. This DRM lets you play songs on iTunes-enabled devices like Windows PCs and Macs and Apple devices like iPhone, iPod and iPad. Also, one can burn the songs on up to 7 audio CDs. However, you will be locked out from moving it to non-Apple devices like Android phone or third-party players. Is there a solution? Yes. In fact, there are two. 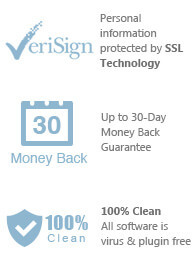 One, you can pay an upgrade price to Apple to replace the DRM-protected version with the DRM-free one. But if you have a large collection, the price to pay is very steep (~99 cents/track). The other option is that you can purchase a DRM removal tool, like Easy DRM Converter for Windows, which lets you remove DRM from existing DRM-protected tracks and convert them to freely playable MP3, M4A or AAC audio files with up to 16X conversion speed and as well as CD quality. The choice is yours depending on what is most cost-effective to you. Does the second option sound great to you? If yes, read on to know how it works. First of all, you will require a computer that running Windows 7/8/8.1/10 and the newest version of iTunes. You will also need to have some old DRM-protected tracks that were purchased in 2009 or before. 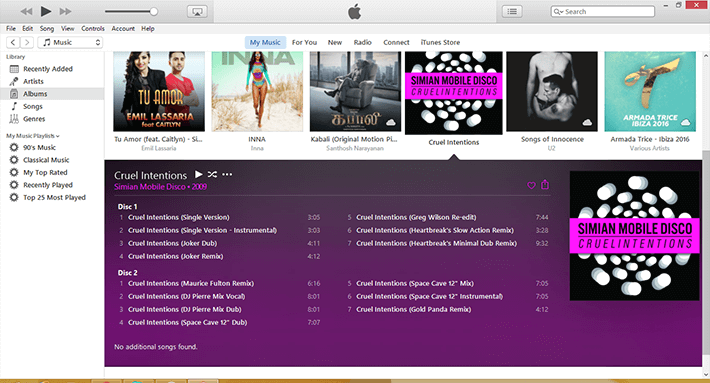 Launch iTunes and locate if your tracks are present in the Library or Albums section. In this example, I have an old purchase from 2009, namely ‘Cruel Intentions’ by ‘Simian Mobile Disco’. This music is not playable outside of iTunes. 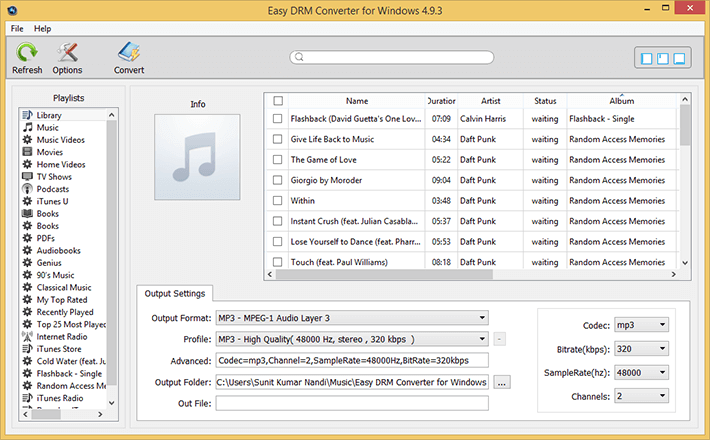 Launch Easy DRM Converter and iTunes will be launched automatically. You can see the list of iTunes library locations on the left panel, audio tracks information at the centre and output setttings on the bottom panel. 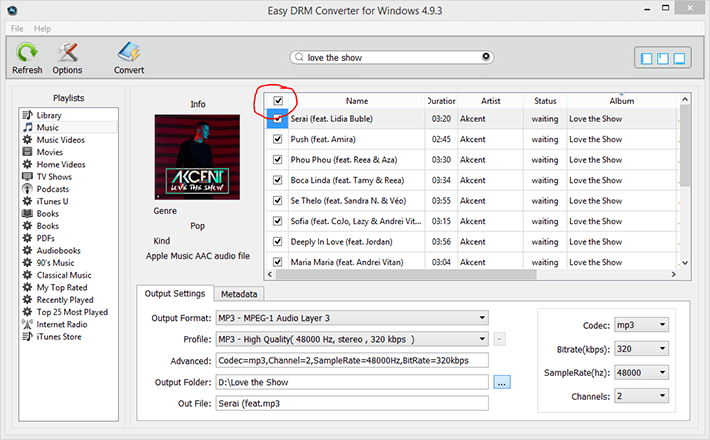 Click the ‘Refresh’ button on the main window of Easy DRM Converter to ensure that the iTunes music library is up to date. 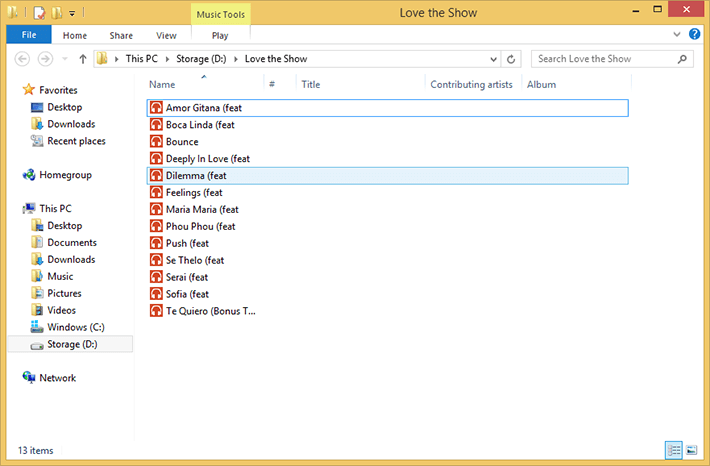 Now type the name of the album in the search bar, namely ‘love the show’. All the songs in that album get listed. Check all the songs in the list. Then set the output format to ‘MP3’ and the profile to ‘High Quality’. The software also supports output to M4A, AC3, AIFF, AU, FLAC, M4R and MKA. Also, set the output folder according to your choice. 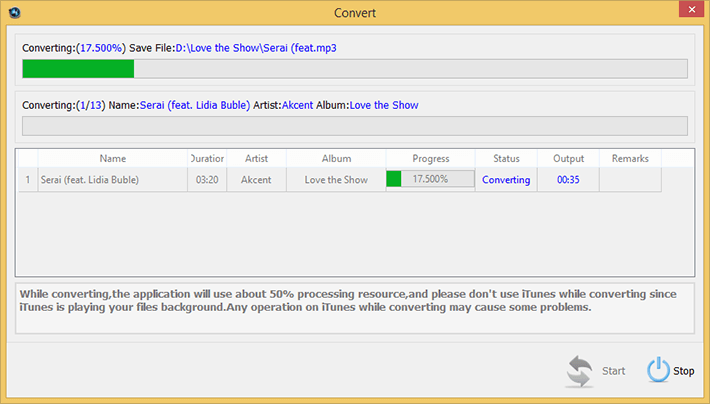 Click "Convert" button to start the converting old iTunes Songs to MP3. All the iTunes Songs can be converted one by one. 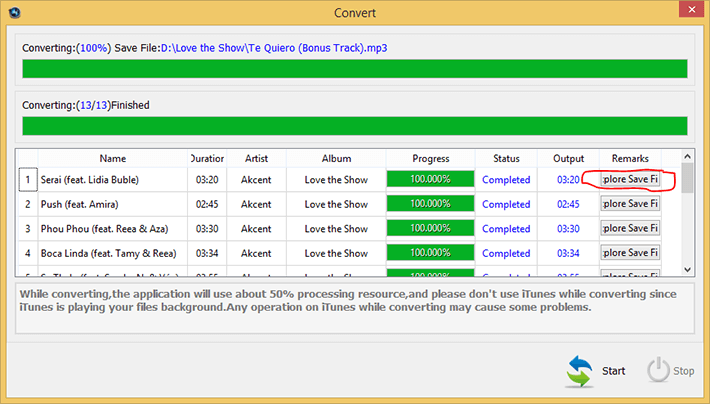 When the conversion finished, you can get the unprotected MP3 files and play them on any media player or mobile phone. Once complete, click the ‘Explore Save File’ button to locate the converted files. The DRM-free MP3 files are in the location you had specified. You now have the freedom to play the converted files outside of iTunes, on any player and any device. Easy DRM converter is a great drm removal tool that can save you the hassle and high costs of upgrading your old DRM-encumbered purchases to DRM-free ones. It works by stripping the DRM from iTunes purchases and converting them to free formats like MP3 and M4A (AAC) making them universally playable. With this method, you can enjoy your old music purchases anywhere you like. Easy DRM converter can be purchased from here at a low price of $39.95 USD and I’ll happily recommend this to anyone who has lots of old iTunes purchases that require huge expenses to purchase upgrades from Apple. 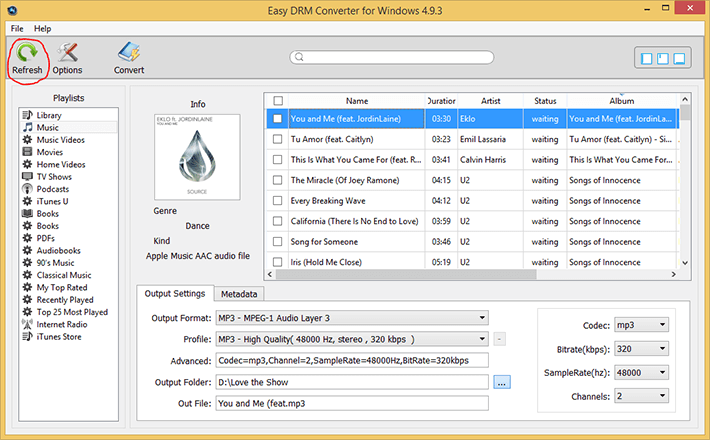 You can immediately download free trial version of Easy DRM Converter from our website and start to remove DRM from old iTunes songs right now !